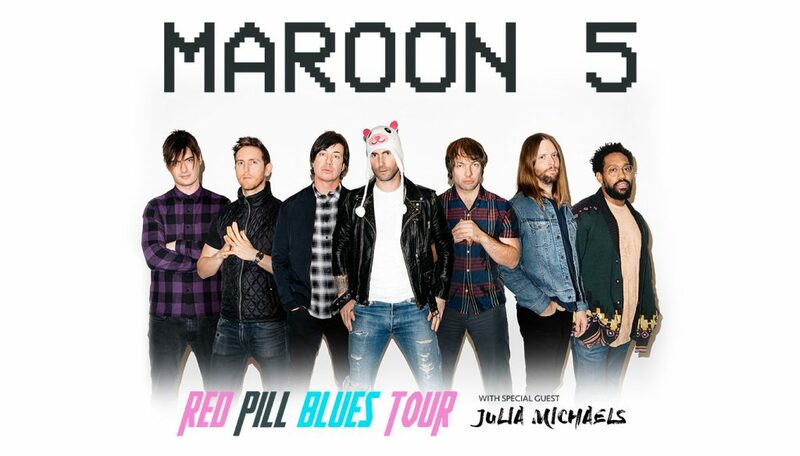 This morning Maroon 5 announced their Red Pill Blues 2018 tour that will bring them to 30+ cities across North America from May 30, 2018 – October 15, 2018 in support of their new album, Red Pill Blues, to be released November 3, 2017. Tickets for the Maroon 5 Red Pill Blues 2018 North American Tour go on sale to the general public starting Saturday, November 4 at 10am local time. Every ticket purchased online will be offered one (1) physical or digital copy of Maroon 5’s upcoming album, Red Pill Blues, to be released November 3, 2017. Be on the lookout for an additional email with instructions on how you can redeem your CD(s). Offer valid for U.S. and Canadian residents only. One CD per online ticket. Not valid for fan-to-fan resale. All albums must be redeemed by February 3rd, 2018 at 11:59pm PST. There will be VIP Packages available for most of the 2018 tour dates. For details on pricing and availability please click the links on the table below to learn more about offers for a specific event. To get first access to tickets, join the official Maroon 5 fan community – the Maroon 5 S.I.N. Club. Members receive presale access to preferred tickets, exclusive access to General Admission tickets in front of the stage, and first access to official VIP Packages. Plus, the new member gift, 10% discount at the Maroon 5 Online Store and more! Join now. Tickets to see the multi-Grammy Award winning Los Angeles group LIVE will go fast. Prep to purchase Maroon 5 concert tickets for the Red Pill Blues 2018 tour in North America with these ticket buying tips. Add artists to your favorites to get notified when they come to a town near you. You’ll always know when the next big event is headed your way and when tickets go on sale. Every second counts. Speed your way through checkout by signing-in ahead of time to the account you plan on using to make your purchase and having up to date billing info stored in your account. Make sure your current credit card, address, and phone information are on file in My Account to make checkout as seamless as possible. Public Wi-Fi networks can slow you down, try to avoid if possible. Download the Ticketmaster App for iOS or Android. for the best way to find and purchase tickets. The Ticketmaster app lets you keep our entire inventory in your pocket and is the easiest way to transfer tickets to friends. You can search and purchase from a phone, laptop, or tablet. But make sure you only use one browser (Chrome, Safari, Firefox, etc.) and one browser tab to complete your purchase. Opening multiple windows or tabs to purchase tickets may result in errors and/or the system may think you’re a bot and your purchase could be blocked. If purchasing on a Mobile device, keep your screen active and don’t move away from the page while completing your purchase. You’ll want to keep your mobile device awake (don’t let it dim) or your session may time out and you could lose your place in line. The fewer tickets you search for, the better chances you’ll have to score seats. Have more than one person in your group buy tickets and sit apart if you have to. You can still carpool. Check out the great VIP Packages and Platinum offers available for this tour. And while we expect tickets to move fast, we’ve always got you covered with 100% Verified Tickets available from other fans for Resale. Additionally, sometimes additional tickets are released after the onsale – even all the way up to a few hours before an event, so check in regularly. Even if you don’t score tickets right away, Ticketmaster has your back with Verified Resale Tickets. Unlike other ticket resellers, Ticketmaster Verified Resale Tickets are 100% guaranteed to get you in to see Maroon 5. Unofficial ticket sellers can only “guarantee” they’ll give you a refund if something goes wrong, but wouldn’t you prefer knowing your ticket is real? Check the list below for local on sale dates, and for other important Maroon 5 ticket sales details. Then, set as many reminders as you need to get in line for tickets as soon as they go on sale.